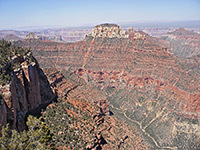 Along with Atoko to the north, Naji is one of the trailless north rim viewpoints, but it lies just 1.5 miles from the Cape Royal Road, and is quite easily accessed by walking through the thick pine/fir forest for about 40 minutes. Although there is no obvious parking area for the hike, the roadsides hereabouts are quite flat, so vehicles may be left on the verge - the suggested place is half way between a bend in the highway and a minor summit just to the north, marked 8,283 feet on the topographic map. This location is 2.5 miles north of the parking area for the Cape Final Trail. The point is named after the second son of the Apache chief Cochise, whose name is variously spelt Naji, Natchi or Naiche. The route to Naji Point is cross country, through generally open woodland that in a few places becomes quite overgrown - due east at first, down a shallow gully into a larger drainage, upstream (left) a little way then up the far side to the top of a ridge, a climb of 200 feet. Continuing east, the land slopes down into a second drainage before rising quite steeply once more for just a short distance to the plateau edge. 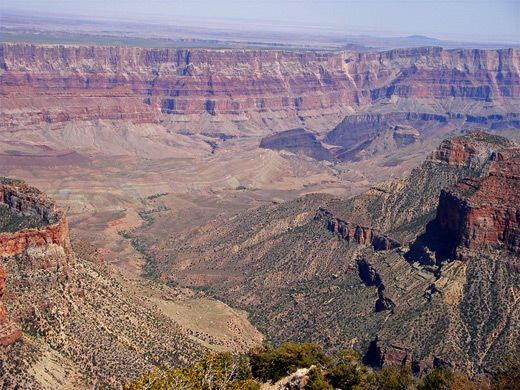 This upwards slope extends right to the rim, so the canyon is completely hidden until the final few steps. Naji Point forms the southern tip of the plateau and is reached by another few minutes walking through a bushy, recently fire damaged area on top of the cliffs. The end is not so well defined since the land does not fall away vertically, and the best perspective is obtained by walking a little way down a narrow ridge extending southeast, until there are no more bushes to block the views. To the south, Naji Point overlooks wooded Natchi Canyon, surrounded on three sides by very steep cliffs beneath the last few miles of the main road and the Cape Final promontory. Lava Creek occupies the eastern foreground, and is bordered by a line of narrow red peaks including Poston Butte and Hubbell Butte. One more unusual feature in view is Hartman Natural Bridge, a thick span over a seasonal drainage at the top of the Redwall limestone layer, near the upper end of the creek. Beyond are many other red cliffs and mesas, and a 15 mile stretch of the Colorado River gorge, centered on the confluence with the Little Colorado River. 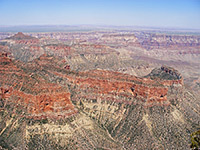 The lower end of Lava Creek (Chuar Valley), however, presents an atypical landscape of smooth, undulating grassy slopes, representing a more advanced cycle of erosion in this part of the Grand Canyon.